For those with a naturalist streak, few places on earth compare with the wonders of Southwest Alaska. Brown bears amble along the hills and plains, and more than 240 bird species inhabit Alaska’s Southwest region. The region’s terrain ranges from a landscape of volcanoes in Katmai National Park created by the 1912 eruption of the Novarupta volcano, to the windswept Aleutian Islands that make a 1,000-mile sweep toward Asia. The Alaska Peninsula extends 550 miles into the Pacific Ocean. 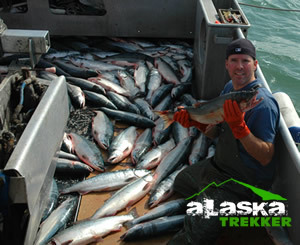 In the west, Lake Clark National Park and Preserve offers a wilderness of seacoast, mountains, glaciers and lakes filled with trophy-sized rainbow trout. King Salmon is the gateway to the exciting Katmai National Park and Preserve, an excellent place to view brown bears. Katmai’s striking landscape was created by the 1912 eruption of Novarupta Volcano. Visitors can hike the Valley of Ten Thousand Smokes independently or take a bus tour, photograph brown bears from the riverside trails, relax at a lodge or fly to other locations within the preserve to take advantage of the finest sockeye fishing in Alaska. Past the tip of the Alaska Peninsula, the Aleutian Islands begin their 1,000-mile sweep towards Asia. These incredible windswept islands, now the location of numerous national wildlife refuges, were the theater for a 19-day battle between Japanese and American troops in May of 1943. Unalaska was the early headquarters of the Russian American Company and center of the sea otter fur trade in the 1700s. The fishing fleet found in Dutch Harbor holds the distinction of leading the nation in quantity and value of landed catch. Visitors to the area can enjoy exploring two examples of early Russian churches as well as an array of World War II military sites that include a vast network of bunkers and pillboxes. Visitors can fly from Anchorage to see the world famous wildlife colonies on St. George and St. Paul Islands in the Bering Sea. Over 240 bird species, including colorful puffins, have been seen on rocky cliffs and grassy tundra. A nesting population of 2.5 million birds makes St. George the host of the largest known sea bird colony in the Western Hemisphere. St. Paul’s beaches also play host to an amazing number of fur seals. Settled by Aleut Natives, the islands were used by Russian fur traders to harvest seal pelts. The island’s many Russian churches can be found on the National Register of Historic Places.